The 2019 Australian federal election will be held on Saturday 18 May 2019 to elect members of the 46th Parliament of Australia. The election was called following the dissolution of the 45th Parliament as elected at the 2016 double dissolution federal election. All 151 seats in the House of Representatives (lower house) and 40 of the 76 seats in the Senate (upper house) will be up for election. The second-term incumbent minority Coalition Government, led by Prime Minister Scott Morrison, is attempting to win a third three-year term against the Labor opposition, led by Opposition Leader Bill Shorten. 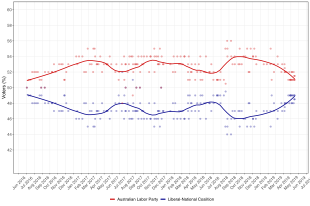 Minor parties and independents will also contest the election, the most popular of which are the Greens and One Nation, according to nationwide opinion polls. The Greens, Centre Alliance, and Katter's Australian Party are defending one House of Representatives seat each. Australia enforces compulsory voting and uses full-preference instant-runoff voting in single-member seats for the House of Representatives and optional preferential single transferable voting in the proportionally represented Senate. The outcome of the 2016 federal election could not be predicted on election night, with too many seats in doubt. After a week of vote counting, neither the incumbent Turnbull Government led by Prime Minister Malcolm Turnbull of the Liberal/National Coalition nor the Shorten Opposition led by Opposition Leader Bill Shorten of the Australian Labor Party had won enough seats in the 150-seat House of Representatives to form a majority government. During the uncertain week following the election, Turnbull negotiated with the crossbench and secured confidence and supply support from Bob Katter and from independents Andrew Wilkie and Cathy McGowan in the event of a hung parliament and resulting minority government. During crossbench negotiations, Turnbull pledged additional staff and resources for crossbenchers, and stated "It is my commitment to work in every way possible to ensure that the crossbenchers have access to all of the information they need and all of the resources they need to be able to play the role they need in this parliament". On 10 July, eight days after the election took place and following Turnbull's negotiations with the crossbench where he secured sufficient confidence and supply support, Shorten conceded defeat, acknowledging that the incumbent Coalition had enough seats to form either a minority or majority government. Turnbull claimed victory later that day. In the closest federal majority result since the 1961 election, the ABC declared on 11 July that the incumbent Coalition would be able to form a one-seat majority government. It was the first election result since federation where the post-election opposition won more seats than the post-election government in both of Australia's two most populous states, New South Wales and Victoria. In the 150-seat House of Representatives, the one-term incumbent Liberal/National Coalition government suffered a 14-seat swing, reducing it to 76 seats—a bare one-seat majority. With a national three-point two-party swing against the government, the Labor opposition picked up a significant number of previously government-held seats to gain a total of 69 seats. On the crossbench, the Greens, the Nick Xenophon Team, Katter's Australian Party, and independents Wilkie and McGowan won a seat each. On 19 July, the Australian Electoral Commission (AEC) announced a re-count for the Coalition-held but provisionally Labor-won Division of Herbert. At the start of the Herbert re-count, Labor led by eight votes. The AEC announced on 31 July that Labor had won Herbert by 37 votes. The final outcome in the 76-seat Senate took more than four weeks to determine, despite significant voting changes. Earlier in 2016, legislation changed the Senate voting system from a full-preference single transferable vote with group voting tickets to an optional-preferential single transferable vote. The final Senate result was announced on 4 August: Liberal/National Coalition 30 seats (−3), Labor 26 seats (+1), Greens 9 seats (−1), One Nation 4 seats (+4) and Nick Xenophon Team 3 seats (+2). Derryn Hinch won a seat, while Jacqui Lambie, Liberal Democrat David Leyonhjelm and Family First's Bob Day retained their seats. The number of crossbenchers increased by two to a record 20. The Liberal/National Coalition will require at least nine additional votes to reach a Senate majority, an increase of three. As per convention, the government and opposition agreed to support a motion in the parliament that the first six senators elected in each state would serve a six-year term, while the last six elected would serve a three-year term. Since the 2016 election, a number of parliamentarians resigned from their seats, while some were disqualified by the High Court of Australia in the parliamentary eligibility crisis as a result of the dual citizenship of some MPs. However, in the cases of disqualified House of Representatives MPs, most of these were returned in resulting by-elections. Some MPs changed their party affiliation or their independent status. Following the Liberal Party leadership spill on 24 August 2018, Malcolm Turnbull was replaced as Prime Minister by Scott Morrison. Turnbull resigned from parliament on 31 August, triggering a by-election in his former seat of Wentworth. The by-election was won by independent Kerryn Phelps. This, combined with National MP Kevin Hogan's move to the crossbench and the resignation of MP Julia Banks from the Liberal Party, has reduced the government to 73 seats going into the election; a net three-seat deficit. Further dissatisfaction within the Liberal Party has seen a number of centrist and economically-liberal candidates announce that they will be nominating as independents in wealthy electorates, with a specific focus on "addressing climate change". The nomination of candidates will close on 23 April 2019. After effects of boundary redistributions for the next election, and the 2018 Wentworth by-election, the Mackerras pendulum has the Liberal/National Coalition government on 74 of 151 seats with the Labor opposition on 71 seats and a crossbench of six seats. Assuming a theoretical nationwide uniform swing, the Labor opposition would need at least 50.6% of the two-party vote (at least a 1.0-point two-party swing) to win 76 seats and majority government. The incumbent Coalition government no longer holds a majority, and would require at least 51.5% of the two-party vote (at least a 1.1-point two-party swing) to regain it. a Although the seat of Dunkley was a Liberal win at the previous election, the redistribution in Victoria changed it to a notionally marginal Labor seat. b Members with names in italics have indicated they will retire at the next election. An election for the House of Representatives can be called at any time during the three-year parliamentary term. The three-year term of the House of Representatives starts on the first sitting day of the House following its election, which in the case of the 45th Parliament was 30 August 2016. The term of the House therefore would expire on 29 August 2019, unless it were dissolved earlier. In this case, the Parliament was dissolved on 11 April and an election called for 18 May 2019. This occurred after Prime Minister Scott Morrison visited the Governor-General advising him to prorogue Parliament and dissolve the House of Representatives. The Governor-General accepted Morrison's recommendations, as is custom in Australia's system of government. The Constitution of Australia does not require simultaneous elections for the Senate and the House of Representatives, but it has long been preferred that elections for the two houses take place simultaneously. The most recent House-only election took place in 1972, and the most recent Senate-only election took place in 1970. However, the writs for a half-Senate election could not be issued earlier than 1 July 2018. Section 13 of the Constitution requires that the election of senators must take place within one year before the terms expire for half-Senate elections. Since the previous election was a double dissolution, half of the senators were allocated three-year terms that end on 30 June 2019, while the other half were allocated six-year terms that end on 30 June 2022. Senators from the territories serve terms timed with House elections. Since campaigns are for a minimum of 33 days, the earliest possible date for a simultaneous House/half-Senate election was 4 August 2018. The latest that a half-Senate election could be held must allow time for the votes to be counted and the writs to be returned before the newly elected senators take office on 1 July 2019. This took over a month in 2016, so practically the last possible date for a half-Senate election to take place before the three-year terms expire is 18 May 2019. An election for the House of Representatives needed to be held on or before 2 November 2019. The latest date for the election is calculated from the Constitution and the Commonwealth Electoral Act 1918 (CEA). Section 28 of the Constitution provides that a term of the House of Representatives expires three years from the first sitting of the House, unless dissolved earlier. The last federal election was held on 2 July 2016. The 45th Parliament opened on 30 August 2016 and its term would expire on 29 August 2019. Writs for election can be issued up to ten days after a dissolution or expiry of the House. Up to 27 days can be allowed for nominations, and the actual election can be set for a maximum of 31 days after close of nominations, resulting in the latest election date for the House of Representatives of Saturday, 2 November 2019. A double dissolution cannot take place within six months before the date of the expiry of the House of Representatives. That meant that any double dissolution of the 45th Parliament had to have been granted by 28 February 2019. Allowing for the same stages indicated above, the last possible date for a double dissolution election would have been 4 May 2019. This could only occur if a bill that had passed the House of Representatives was rejected by the Senate twice, at least three months apart. On 11 April 2019, the office of the Governor-General released documents relating to the calling of the election. The documents set out a timeline of key dates for the election. The election period includes three national public holidays. Good Friday (19 April), Easter Monday (22 April) and Anzac Day (25 April). Since the last election, there has been a reapportionment of seats of the House of Representatives, as well as three scheduled redistributions of electoral boundaries. On 31 August 2017, the Australian Electoral Commission announced a reapportionment of seats based on calculation of each state and territory's entitlement determination: Victoria gained one seat to 38, the Australian Capital Territory gained a seat to 3, and South Australia lost one seat to 10. The total number of members of the House of Representatives increased from 150 to 151. On 7 December 2016, the Electoral Commission for the Northern Territory announced the results of its deliberations into the boundaries of Lingiari and Solomon, the two federal electoral divisions in the Northern Territory. New boundaries gazetted from 7 February 2017 will see the remainder of the Litchfield Municipality and parts of Palmerston (the suburbs of Farrar, Johnston, Mitchell, Zuccoli and part of Yarrawonga) transferred from Solomon to Lingiari. A scheduled redistribution began in Tasmania on 1 September 2016, to be finalised by November 2017. The determinations were announced on 27 September 2017. In addition to boundary changes, the Division of Denison will be renamed the Division of Clark after Andrew Inglis Clark. A scheduled redistribution began in Queensland on 6 January 2017, and was finalised on 27 March 2018. Changes were made to the boundaries of 18 of Queensland's 30 electoral divisions, and no division names were changed. A redistribution of federal electoral divisions in the Australian Capital Territory commenced on 4 September 2017, due to changes in the territory's representation entitlement. The AEC released a proposed redistribution on 6 April 2018, and the final determination on 3 July 2018. The redistribution resulted in the creation of a third ACT electoral division named Bean (notionally fairly safe Labor), after historian Charles Bean. A redistribution of federal electoral divisions in Victoria commenced on 4 September 2017, due to changes in the state's representation entitlement. The determinations were announced on 20 June 2018, and created a 38th electoral division named Fraser (notionally safe Labor), named after prime minister Malcolm Fraser. The commission also renamed several divisions: Batman to Cooper (after William Cooper), McMillan to Monash (after Sir John Monash), Melbourne Ports to Macnamara (after Dame Jean Macnamara) and Murray to Nicholls (after Sir Douglas and Lady Nicholls). A proposal to rename Corangamite to Cox (after swimming instructor May Cox) did not proceed. The Coalition notionally lost the seat of Dunkley and Corangamite to Labor in the redistribution. A South Australian seat was abolished due to population changes having occurred since the state's last redistribution in 2011. Although South Australia's population was still increasing, faster increases in other states saw a reduction in South Australia's representation from 11 to 10 seats in the 151-seat House of Representatives. This was the third time South Australia lost a seat since the 1984 enlargement of the parliament, with Hawker abolished in 1993 and Bonython in 2004. South Australia is the least-populated state where the current number of seats can decrease, as Tasmania's current representation is the minimum guaranteed by the Constitution. A redistribution of federal electoral divisions in South Australia commenced on 4 September 2017, due to changes in the state's representation entitlement. The proposed redistribution report was released on 13 April 2018, and the final determination on 26 June 2018. The commission abolished the division of Port Adelaide. The hybrid urban-rural seat of Wakefield became the entirely urban seat of Spence, after Catherine Helen Spence. The more rural portions of Wakefield transferred to Grey and Barker. Australian newspapers traditionally provide editorial endorsement for parties contending both federal and state elections. Metropolitan and national dailies have always endorsed either the Coalition or Labor, whilst alternatives have in recent times provided backing for minor parties. Green Left Weekly was the first newspaper to provide an endorsement, urging a vote for Victorian Socialists in Victoria and Socialist Alliance elsewhere. ^ "Australian electoral systems". Parliamentary Library. Parliament of Australia. Retrieved 16 September 2018. ^ "Swing against Malcolm Turnbull's Coalition leaves election on a knife-edge". ABC News. Australia. 2 July 2016. ^ "We don't have a winner, so what happens now?". ABC News. Australia. 3 July 2016. ^ "How the night unfolded with no clear winner". The Guardian. Australia. 3 July 2016. ^ "Election 2016: Ballot count could take a month to finalise, AEC says". ABC News. Australia. 4 July 2016. Retrieved 4 July 2016. ^ Gough, Deborah (3 July 2016). "Australian federal election 2016: No results until at least ... Tuesday". Sydney Morning Herald. Retrieved 4 July 2016. ^ "Liberals 'cautiously optimistic' on majority". Sky News Australia. 4 July 2016. Retrieved 4 July 2016. ^ Hunter, Fergus (4 July 2016). "Australian federal election 2016: Bill Shorten says Malcolm Turnbull 'should quit'". Sydney Morning Herald. Retrieved 4 July 2016. ^ Ross, Monique (10 July 2016). "Election 2016: Malcolm Turnbull claims victory after Bill Shorten concedes defeat". ABC News. Australia. Retrieved 10 July 2016. 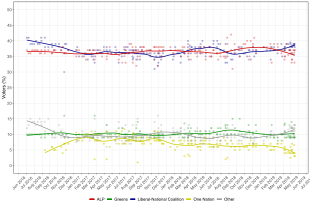 ^ "Australian Politics and Elections Database: University of Western Austrralia". Elections.uwa.edu.au. 13 March 2018. Retrieved 19 March 2018. ^ "Statement from the Australian Electoral Commission: Recount in the Division of Herbert" (Press release). Australian Electoral Commission. 19 July 2016. Retrieved 25 July 2016. ^ "Federal Election 2016 Results". Australia Votes. Australian Broadcasting Corporation. 3 July 2016. Retrieved 3 July 2016. ^ "Labor wins seat of Herbert after recount". Abc.net.au. 31 July 2016. Retrieved 11 August 2016. ^ Federal Politics (31 July 2016). "Labor takes seat of Herbert, leaving Malcolm Turnbull with majority of just one seat". Smh.com.au. Retrieved 11 August 2016. ^ Hasham, Nicole (3 July 2016). "Election 2016 results: Senate count throws up a wild mix as One Nation, Fred Nile, Liberal Democrats vie for seats". news.com.au. Retrieved 3 July 2016. ^ "AEC". Twitter. Retrieved 11 August 2016. ^ "Senate photo finishes". crikey.com.au. 12 July 2016. Retrieved 30 July 2016. ^ "Senate terms: Derryn Hinch and Greens' Lee Rhiannon given three years". The Guardian. Australia. 12 August 2016. ^ "Coalition and Labor team up to clear out crossbench senators in 2019". Sydney Morning Herald. 12 August 2016. ^ editor, Katharine Murphy Political (29 January 2019). "It's time to 'take out' environment ministers who fail on climate, says Oliver Yates" – via www.theguardian.com. ^ Karp, Paul (28 January 2019). "Zali Steggall promises climate change fight with Tony Abbott in Warringah" – via www.theguardian.com. ^ a b c Green, Antony. "2017–18 Federal Redistributions". ABC Elections. Australian Broadcasting Corporation. Retrieved 25 August 2018. ^ "Gold Coast Federal Minister Steven Ciobo quitting politics". The Courier-Mail. 1 March 2019. Retrieved 1 March 2019. ^ Borys, Stephanie; Doran, Matthew (15 March 2019). "Turnbull lieutenant Craig Laundy quits, months after moving to backbench". ABC News. Retrieved 15 March 2019. ^ "Christopher Pyne bows out of politics as Morrison reshuffles Cabinet". ABC News. 2 March 2019. Retrieved 2 March 2019. ^ Bourke, Latika (18 April 2019). "'What this means for my young family': Senator Tim Storer quits". The Age. Retrieved 18 April 2019. ^ "Federal election 2019: Prime Minister Scott Morrison sets May 18 election date". ABC News. 11 April 2019. ^ a b c d e f g h "Documents relating to the calling of the election for 18 May 2019" (PDF). Governor-General of Australia. 11 April 2019. Archived from the original (PDF) on 11 April 2019. ^ "Proclamation - Prorogue the Parliament and dissolve the House of Reps". Federal Register of Legislation. Australian Government. 11 April 2019. ^ "2016 Parliamentary sittings". Parliament of Australia. Retrieved 12 August 2016. ^ "Commonwealth Electoral Act, s. 158". Austlii.edu.au. Retrieved 19 March 2018. ^ "Voting options". Australian Electoral Commission. Retrieved 14 April 2019. ^ a b "Determination of membership entitlement to the House of Representatives". aec.gov.au. 31 August 2017. ^ "Media release: Augmented Electoral Commission decides names and boundaries of federal electoral divisions in the Northern Territory". Australian Electoral Commission. Retrieved 7 December 2016. ^ "Tasmanian redistribution indicative timetable". Australian Electoral Commission. Retrieved 31 August 2017. ^ "Names and boundaries of federal electoral divisions in Tasmania decided". Australian Electoral Commission. Retrieved 27 September 2017. ^ "Queensland redistribution indicative timetable". Australian Electoral Commission. Retrieved 31 August 2017. ^ "Step 6 – announcement of names and boundaries of federal electoral divisions in the Australian Capital Territory". Australian Electoral Commission. Retrieved 6 July 2018. ^ "Proposed federal electoral divisions for ACT released". Australian Electoral Commission. Retrieved 6 April 2018. ^ "2017-18 Federal Redistribution - Australian Capital Territory". ABC Elections. 20 June 2018. ^ "2017-18 Federal Redistributions - Victoria". ABC Elections. 20 June 2018. ^ "Electoral redistributions during the 45th Parliament: APH Statistics and Mapping". Aph.gov.au. 25 August 2016. Retrieved 19 March 2018. ^ "South Australia to potentially lose federal seat under future redistribution". Abc.net.au. 25 August 2016. Retrieved 19 March 2018. ^ "South Australia set to be reduced to 10 federal electorates". The Advertiser. 25 August 2016. Retrieved 19 March 2018. ^ "Electoral Commission scraps seat of Port Adelaide held by Labor MP Mark Butler". ABC News. 25 June 2018. ^ "Proposed federal electoral divisions for South Australia released". Australian Electoral Commission. Retrieved 13 April 2018. ^ "2017-18 Federal Redistribution - South Australia". ABC Elections. 26 June 2018. ^ "Federal electoral divisions in South Australia formalised". Australian Electoral Commission. 20 July 2018. Retrieved 28 July 2018. ^ a b Alex Bainbridge (5 April 2019). "Federal elections: Why you should support the socialists". Green Left Weekly. Retrieved 11 April 2019. ^ "Victorian Socialists: a socialist voice in federal politics | Red Flag". Red Flag. Retrieved 14 April 2019.